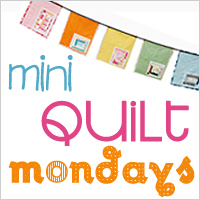 Last week my quilting wonder twin Aimee at Salt Marsh Designs invited me to join her in Fresh Lemons' Mini Quilt Mondays. September always feels like a fresh start to me, a time to try new things and meet new friends, so this is the perfect way to kick-off the school year. 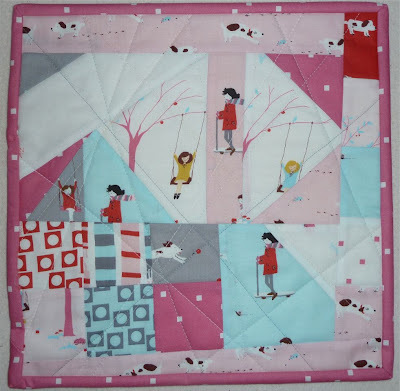 This week I used a pile of Sherbet Pips scraps and some improv piecing to come up with this mini quilt. I love your improv piecing! It turned out fabulous and the quilting fits it perfectly. Great job! you crazy cat! i love it!! this is beautiful...i love it. it looks like such a fun scene with that adorable fabric. So much fun! Love the pick up sticks description! Very cool, Alice! So different from what you usually do!